We were kind of wondering where "the restaurant" part was of Awash Market and Restaurant during a recent visit. I looked up toward the back of the market and saw the doorway. We decided to return a couple of days later to try out the food. The dining area is bright red, quite clean, and on one of our visits, pretty darn quiet. On our first visit however, the place was hopping. It was the European Soccer Championships and there all the tables except one was full of guys watching the game....lot's of laughter and good natured ribbing going on. Even though the conversations weren't in English, there are things that are universal. The conversations that we couldn't understand made us feel like we were on holiday again, which was strangely comforting to us. The guys working here are very friendly and once they saw us, menus were delivered to our table. All dishes are described quite well. Not really knowing what the specialty here was, we both decided to order combinations plates which are $9.99. I went with the meat combo. Though there were some similarities in the look of the various stews, each had it's own distinct flavor. The two lamb dishes were our favorites...the lamb flavor came through quite well. She did enjoy Her vegetarian combination. She particularly loved the red lentil and stewed kale and pretty much finished everything off. Meanwhile, I found my plate to be quite filling and had enough for another meal. Needless to say, we returned a couple of weeks later. The missus again went with the vegetarian combination, but I decided on the item I enjoyed the most the last time, Yebeg Siga Wot ($9.99), basically lamb stewed in berbere, the classic Ethiopian spice mix. The lamb was nice and gamey, the spices came through nicely but didn't take over the dish, and heat level wasn't very high overall. It was a rather heavy dish. I managed to put away only about a third of it. When we asked the young man walking through for a box, he looked at me and said, "but you haven't eaten!" The leftovers, including the injera was enough for two more meals. I ended my meal with a nice cup of espresso...the beans are roasted in the shop, you can see it at the front counter. The drill for eating here is simple....you have a seat in the dining room, I just go ahead and grab our menus when we arrive. One of the guys working there will see you and take your order. When you're done, you go up front to pay...... Funny thing, it's almost like we're on the honor system. You tell the cashier what you had and they ring it up. If you need more injera, they do a brisk business of selling that stuff in the market as well. The Missus enjoys this place the most of the Ethiopian Restaurant's we've been to in San Diego; Awash, Asmara, Harar, Bayu's, and Red Sea, so I think we'll be going back again soon. There are two types of Kitfo on the menu, and I'm interested in trying them out. This is mostly Kirk's foodblog. Sometimes Cathy blogs here too. Today's blog is by ed (from Yuma). My plans were up in the air - so many enticing dining options that my mental palate couldn't decide. So a decision happened. I remember my first Ethiopian restaurant about 30 years ago in Portland, Oregon. The exuberant and friendly owner told stories about diving for cover during World War II when the Italian fighter planes strafed his home village. He made it seem like a child's game. Between his stories and the food, it was a totally different restaurant experience. And the food – the sourish gray pancake covered with a lamb shank stewed almost to disintegration in a dark and fiery sauce full of spices and flavors I had never encountered before. My mouth burned in a really good way. In any case, I am still a sucker for Ethiopian food even though most other Ethiopian restaurants don't live up to my original memory (memory is like that sometimes). Upon entering, I was greeted by a friendly and pleasant hostess who would also be my server. While I quickly located a sampler platter on the menu, it was interesting to watch and listen as she explained the cuisine to some newbies – trying to be as accommodating to their requests and desires as possible. I ordered the giant combination, called Taste of Bayu's. At $26.50, it was certainly the most expensive item I've ever ordered at an Ethiopian restaurant. What's more, the meal would be gigantic, more than I could possibly eat, but I could sample a range of this restaurant's dishes. She was right. Although the beer by itself tasted rather sweet and bland, it paired nicely with the cuisine. This is the national bread of Ethiopia. Is a fermented flatbread made from a grain called teff. This grassseed is gluten free so the bread does not rise. When the dough is placed on the flat grill, it bubbles like a pancake. Unlike a pancake, is not flipped over, so one side is flat and smooth and the other is like a sponge. The meal came with this basket full of cool injera rolled into cylinders (I have no idea why injera is never served heated). But injera is not just a bread, not just a starch; it is also the main utensil. When eating Ethiopian food, you tear off a piece of injera and use it to scoop up your food and place it in your mouth. 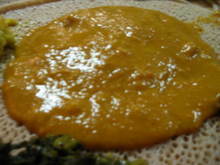 In addition, Ethiopian meals are presented on large round discs of injera. The bread then is knife, fork, and plate. The meat dishes were on the left and center - the vegetarian dishes around the right side. Best way to describe the meal is to proceed clockwise with additional pictures when they are helpful. Starting at 12 clock, we have misir wat, spicy lentil stew. I grew up eating lentils and almost never dislike a lentil dish. Here the flavorful pulse was enhanced by Ethiopian spices including ground dried chilies, giving the dish a nice moderate heat level. The contrast went deeper. The peas had a chewier texture and a robust and earthy flavor profile – with just a light kiss of curry spices. The meat was finely chopped beef cooked in butter. Its flavor was very meaty, though there was a touch of greasiness left on my tongue. On its right is ayib, translated Ethiopian cottage cheese on the menu. But in some ways it reminded me more of a cotija or perhaps a feta, drier and saltier than most conventional American cottage cheeses. The greens, gomen, are chopped and stewed collards. Minimally spiced, they were nicely prepared – not overcooked at all. The flavor of the collards spoke spoke to me without an interpreter. While each of these three items was uniquely itself, they complemented each other well. One intensely meaty, one simply cheesy, and one greenly vegetal. I understand why they are often served together. The next two items were sega wat (spicy beef stew) and yebeg alecha (mild lamb stew). In contrast with the tibs, both of these meats were cooked to a soft stewed texture. This centerpiece was a little disappointing to me. There seem to be as much boiled egg as chicken. And the sauce, while flavorful, wasn't as intense or as fiery as I have had other places. To be fair, one poster at Yelp complained that the chicken stew was inedibly hot, so maybe Bayu's has toned things down a bit since then. While some sort of salad is usually included in Ethiopian combination plates, those salads are often bland combinations of chopped lettuce and tomato. Here, however, the diced onions and tomato had been tossed with some sort of vinegar, making the salad an excellent and tangy palate cleanser. I loved it. While you can use pieces of the separate rolled injera to pick up morsels of meat and vegetables, I prefer to use the injera on which the items are served. While that is certainly the messier option, it is also the juicier option. And I am not embarrassed to lick my fingers, particularly when they taste this good. 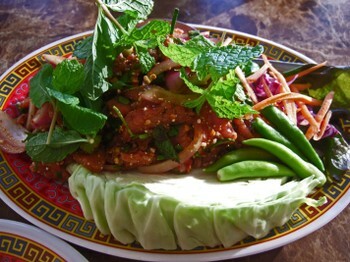 Overall, my experience at Bayu's was a positive one. I would happily return. The atmosphere and service were excellent. While it would have been nice to have some berbere paste available on the platter or on the side to add fire, the spicing was generally satisfactory and complex. It would also be interesting to try some of the dishes that are not on the combination plate, like creamy tasting shiro (ground peas), a different lamb dish (spicy stew or lamb tibs) or even gored gored, a raw beef dish. Because of the friendly and helpful service, Bayu's would also be a good restaurant for folks unfamiliar with Ethiopian cuisine. 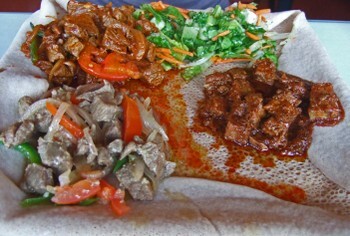 Bayu's Authentic Ethiopian, 530 University Avenue, San Diego, CA 92103, (619) 546-0540. Recently, the Missus has become one of those "ladies who does lunch." And has been grabbing lunch at various places with Her friends. 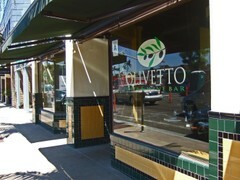 One of the favorites of the "ladies who do lunch" is the new Olivetto Cafe and Wine Bar. "The Girls" have eaten there at least 5 times, mostly because of convenience, service, and the place is usually empty, so a 2 to 3 hour lunch is not out of the question. During one recent lunch hour, the Missus and I managed to meet up for an now all too rare lunch. The Missus went over what She thought was the restaurants strong points......appetizers(except the cheese & salumi plate). She has been less than satisfied with the burger, pastas, etc..... So now She and the Girls just do appetizers. The paper thin beef tenderloin was okay, as was the olive oil, nothing special. The Missus loves parmigianno-regiano, and this was nice a milky. So much for Chinese hating the "congealed - curdled milk of an old cow's udder". 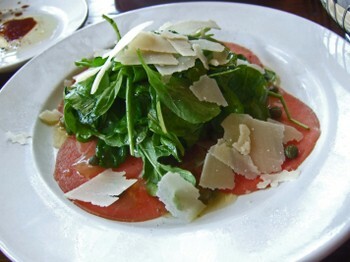 We both enjoy Arugula, and this was a fine middle of the road version of the dish. The Missus told me that Her friend 'K', had raved about these, repeating over and over to the Missus, "can't you smell the truffle oil". To which the Missus replied, "it smells good, but I don't know what truffle oil smells like!" I loved the appearance of the thin, almost shoestring fries. 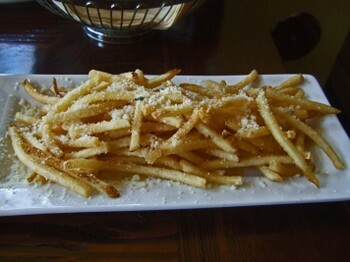 The last several times I've had truffle fries, they've been oily, heavy, and went soggy quickly. These were the polar opposite, and the Parmesan added a nice saltiness to the dish. As for the truffle oil, this dish had an almost buttery smell, and I felt like I could make out 2,4-Dithiapentane. The fries were rich and filling, and even though I've rarely met a fry I didn't finish, I couldn't finish these. 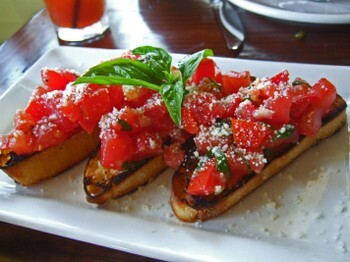 We also had the Bruschetta Del Giorno ($5.50), the Bruschetta of the day. Nice, ripe tomatoes bursting with flavor, basil, Parmesan...all would have been working in nice harmony if the bread had not been incinerated. The service at Olivetto was very relaxed, friendly without being intrusive(according to the Missus this is not always the case), and our waters and drinks were refilled throughout. I'm glad the Missus has a nice, relaxing, and not the least bit stuffy place to grab a nice lunch with Her friends. You can also read Gil and Krista's post on Olivetto. 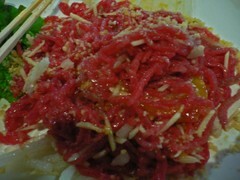 Next stop on the mmm-yoso "raw tour", Sab-E-Lee, and one of my current favorite dishes; Koi Soi (Spicy Raw Beef - $6.95). Like I mentioned before, I've had this dish at two other places, one was very good (though not as good as this), and the other was very difficult for me to eat. This on the other hand is very easy for me to eat. 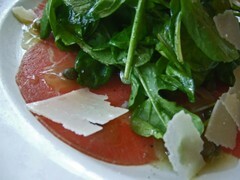 Yes, in spite of the heat from the chilies, this is one dish that I find hard to stop eating. A pinch of the salad in cabbage in one hand. A ball of sticky rice in the other. Once you start you dare not lose momentum. You can read FOY Candice Woo's article on Sab-E-Lee for CityBeat, here. Geekyfoodie's post can be found here. Alice Q Foodie's post can be found here. It is an actual item on the menu at Asmara. Spaghetti is not very high on the list of items I'd like to try at an Eritrean Restaurant, though please tell me if you've tried it, and like it. It's called Kitfo, and is the Ethiopian/Eritrean version of steak tartar; finely chopped (not ground) raw beef, flavored with niter kibbeh (a herb infused clarified butter), mitmita (a spicy powder seasoning), and herbs. It is served with the ubiquitous, carpet-padding-look-alike-eating utensil(you use pieces of it as your eating implement - don't ask for a spoon), the sour and spongy flatbread Injera. This version was not as sour as others, and along with what was used to line the plate, we each received another plate with several "rolls" of injera. 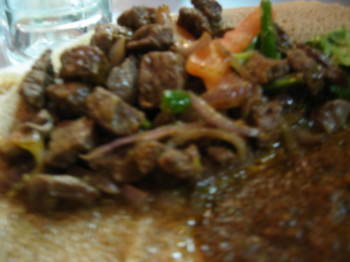 Less you think this is a light dish, it is rich, and the injera is heavy, and we both got really full, really quickly. The portion size is more than sufficient, the spiciness of the mitmita is not too bad either . Emboldened by Her experiences with the Koi Soi, the Missus dug right in, and was stopped dead in Her tracks. She found eating a raw beef dish that is slightly North of warm (from the clarified butter I assume), and the very strong flavor of the herbs to be disconcerting. This dish stayed with me for a loooong time, as did the aftertaste of the cardamom and fenulgreek. I could still taste it the next morning. If you've never had this type of food before, Asmara is a great place to start. 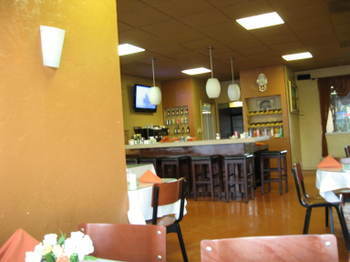 The restaurant is very clean, and the folks who work here are friendly. I think the gentleman who served us was a bit taken aback when I ordered, but I told Him I've had Kitfo before at a restaurant on Fairfax in Los Angeles, and he was good to go. Canine Cologne posted about her visit to Asmara here. I've posted on Yookwe (Yuk Hwe) from Buga before. I've never gotten a clean shot off, since the ladies always insist on mixing it for when they bring it to my table. I understand that an unmistakable pile of raw meat, topped with a raw egg can be disturbing. But when it's good, it's quite good. Unfortunately, the last 2 times, the meat has tasted a bit off, so I think I'll pass on this dish from now on. Too bad, Buga is about the only place in San Diego that I trust enough to even order this. Kirk will soon be back posting about his incredible trip to Vietnam & Cambodia. Cathy will soon post more about her culinary adventures. Other folks help out on this blog as well. Today, though, it is ed (from Yuma) writing about a new restaurant he just visited in San Diego. When I lived in San Diego about 10 years ago, I delighted in the vibrant Ethiopian/East African community in the city. While my previous exposure to their cuisine had been limited, I loved Ethiopian food. Unfortunately, the Ethiopian restaurant scene in America's Finest City left much to be desired. My favorite Ethiopian restaurant (called Asmara) closed. Another place that served good food had virtually no customers, perhaps because no one would have expected a restaurant called Legare to be an Ethiopian restaurant; the warm and friendly owner explained that everyone in Addis Ababa knew that the best restaurant food was at the train station, which being built by the French, was called Le Gare. But for those of us not from Addis Ababa . 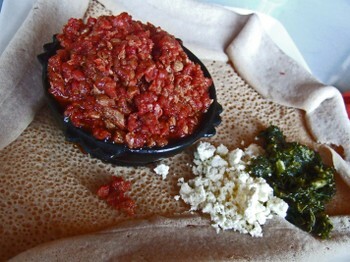 . .
We were all very impressed with the injera, the bubbly sourdough flatbread full of tef flour and flavor. It had a pronounced sour tang and seemed a little thinner and less doughy than other versions I have eaten. 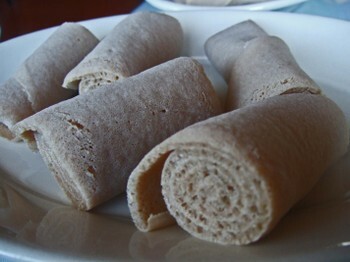 For those of you unfamiliar with Horn of Africa cuisine, the injera is the starch, the plate, and the eating utensil. 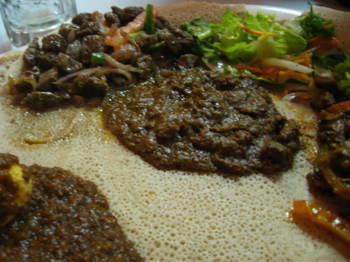 One picks up bits and bites of various foods with pieces of injera held between the fingers. 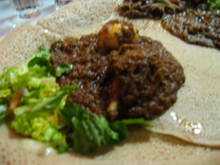 In addition to the injera that covered the platters, more injera wrapped up around itself was also served on the side. However, as everyone who has eaten Ethiopian or Eritrean food is aware, the best tasting injera is that which has lain under the entrees and soaked up all their essential goodness. Not counting the cost of the Eritrean and Ethiopian beers that we ordered (my advice: order more conventional beers) the cost of the dinner was about $10 a person. None of the entrées is over $10. I felt that the dinner was a very good value, particularly considering the pleasant setting. Is this a great restaurant? Well, I don't know. 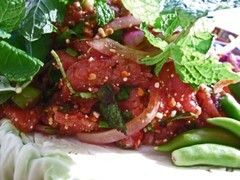 We didn't try either of the beef dishes which can be ordered raw (gored-gored and kitfo). However, everything we were served was well prepared and well seasoned. Only the rather ordinary and underdressed salads (containing fresh jalapeno slices to get one's attention) were disappointing. I can't recall ever having better East African food in San Diego. This would certainly be a great place for someone who had never tried Horn of Africa cuisine before. On the other hand, the menu at Asmara doesn't appear to break new ground, and most items listed seem similar to those at most conventional Ethiopian restaurants, except that some have different names. 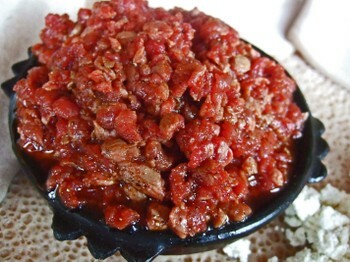 Perhaps the most unusual thing on the menu is the weekend special, spaghetti with your choice of meat or tomato sauce. This pasta is a reminder that Eritrea spent many years as an Italian colony. In Ethiopia, on the other hand, the Italians were hated invaders whose brief rule had little effect on that nation's cuisine. 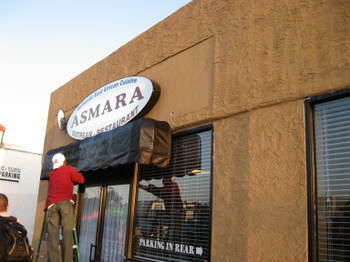 Asmara Eritrean Restaurant, 4155 University Ave, (619) 677-3999. Open daily 11 AM - 10 PM.